Christopher Mayell as "Taylor" & Ken Lavigne as "Philip". 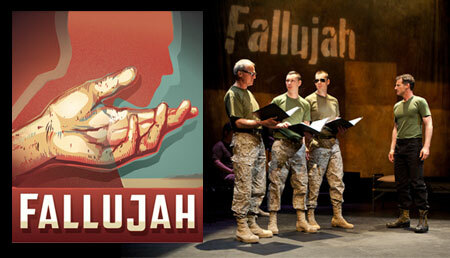 City Opera Vancouver’s first commission was the chamber opera Fallujah. From 2010 – 2012 City Opera Vancouver created this new work. It was made possible by $250,000 USD from The Annenberg Foundation and explore.org, with another $100,000 USD for a film about its development. With music by Canadian Tobin Stokes, libretto by Iraqi-American Heather Raffo, based on the story of USMC Sgt Christian Ellis, and originally directed by John Wright, Fallujah is a powerful indictment of war, and its enduring agony in PTSD. In March 2016, Fallujah was premiered in Los Angeles by our friends at Long Beach Opera, and received wonderful reviews. LOS ANGELES TIMES: Captures with the vividness I recall as a correspondent and the anguish, rage and bewilderment of disparate cultures and lives trapped by larger designs. ORANGE COUNTY REGISTER: ‘Fallujah’ has packed a punch... powerful moments... and by the end, a listener’s thoughts and feelings have been stirred... consistently strong cast... For those who want their opera relevant, here it is. OPERA NOW: The new work is a highly relevant one that strikes fear in the heart of contemporary American consciousness… Composer Tobin Stokes’ score, with a fascinatingly woven and psychologically fraught libretto by Iraqi-American writer Heather Raffo, capitalizes on the unique dimensions and expressive latitude of 21st Century opera. In November 2016, Fallujah was given its New York premiere at New York City Opera, and in April 2019 at Opera Carolina. Fallujah began with a conversation between Charles Annenberg Weingarten and Christian Ellis, several years ago. It was Charlie’s inspiration to propose that this story of war, and survival, and the reality of veterans’ lives, can speak to all of us – in musical terms. It is City Opera’s obligation to lead in the creation of a brand-new work, one where we discover that the beauty of opera can impel an audience to think about the truth of its text. War is nightmare for everyone. Understanding and compassion is remedy for everyone. In our story, we see layers of connection. USMC sergeant Philip Houston meets a teenage Iraqi named Wissam. Their almost alien encounter leads to tragedy, and revelation. Philip’s mother sings in duet with Wissam’s mother – but they never meet. The agonies of PTSD are played out in the memory and re-living of horror, but at the end Philip understands that he was named “to mean something”. Salvation lies in humane identity. Opera has the power to speak these truths. But even the whole beauty of Tobin’s music, and the power of Heather’s libretto, and the truth of Christian’s battlefield encounters, are no guarantee that Fallujah gets it right. Its reception will confirm if we have succeeded. If we have, we expect to produce and publish and record and televise Fallujah, and to see it presented in many houses, to see it toured, and to watch it take a place in the great tradition of strong and memorable opera. With your help, and with all thanks to the Annenberg Foundation, and explore.org, and their extraordinary commissioning grant of $250,000 USD, this is exactly what we will achieve. IF YOU WOULD LIKE TO WATCH the creative process that led to Fallujah, you are invited to view the trailer, eleven brief webisodes, and the final 24:00 documentary that we produced for this project. Led by John Bolton and Opus 59 Films of Vancouver, and made possible by an additional $100,000 grant from the Annenberg Foundation of Los Angeles, these films take you backstage across the whole of the work. Meet its creators, originators, singers and stagers. Please let us know what you think. Thank you.